ECOs-Locais is a national project that aims to promote environmental citizenship, a more active and informed participation of young people in society and raise awareness and participation in the prevention and resolution of environmental problems, helping to build a sustainable world. The oceans and coastal areas are one of the major topics covered in this programme in which actions consist, in general, in coastal areas cleanups. This project is directed to organized groups of young people. In its implementation phase (2009/2010) it involved groups of scouts of CNE (National Body of Scouts), aged between 14 and 22. Indirectly, the project covers family, friends, schools and local communities. When a group joins ECOs-Locais, it is challenged to plan an ECO-Action. An ECO-Action is a specific action to prevent or solve an environmental problem that each group intends to carry out independently. Initially, the group performs an environmental diagnosis of the area in questions, using predefined forms, in order to define priorities of action. 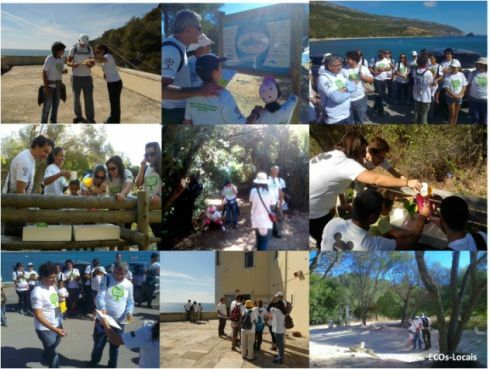 All ECO-Actions are supported by the ECOs-Locais website (http://ecoslocais.lpn.pt/), the project coordinator of LPN (League for the Protection of Nature) and local agents of SEPNA (Office for the Protection of Nature and Environment of the Republican National Guard).